Mark your calendars -- the next competition opens in December 2019! Capture the essence of Erma's writings and you could win $500 and a free registration to the Erma Bombeck Writers Workshop to be held April 5-7, 2018, in Dayton, Ohio! Erma Bombeck, graduated from the University of Dayton in 1949, lived with her husband and family in Centerville, Ohio, and inspired people worldwide with her columns and books about life's trials and tribulations. Her memory lives on with the Erma Bombeck Writing Competition hosted every two years by the Washington-Centerville Public Library and the Erma Bombeck Writers' Workshop hosted by the University of Dayton. Check out these great books and movies. Sign up for the FREE Erma Bombeck Writers' Workshop email newsletter. View the 2018 competition statistics. Entries are accepted from anywhere in the world. Previous contest winners are encouraged to enter. Children under 13 are NOT eligible to enter. Registration to the University of Dayton's Erma Bombeck Writers' Workshop is NOT required to enter the writing competition. The following are not eligible to enter: Washington-Centerville Public Library employees & board members, contest judges and their families, and Erma Bombeck Writers' Workshop faculty and speakers for the current year. Entry must be written in English. Limit one entry total (not per category) per person. Personal essay must be 450 words or less (entries of more than 450 words will be disqualified). Essay must be previously unpublished in its entirety or pieces thereof. Essays must not have been previously published in a blog, book, magazine, website or any other medium. Essay must be written by one person; no writing teams, ghostwriters or writing partnerships. Payment and entry must be submitted online using the official online entry form. PayPal link will be visible below when the contest opens. You do not need to set up a PayPal account in order to pay the Entry Fee. PayPal accepts credit cards and is simply the administrator of the payment. Hard copy entries will not be accepted and will not be returned if submitted. Entries must be submitted by 8 AM, EST, January 3, 2018. All submissions are final! Corrections to and replacements for submitted essays will not be allowed. By submitting your entry, you guarantee the work was written by you and expresses your original ideas. Washington-Centerville Public Library reserves the non-exclusive right to publish the winning entries; however, the owner retains ownership rights for future publication. Write a personal essay of 450 words or less following the judging criteria. Entries in the Erma Bombeck Writing Competition are judged in two rounds - first by a panel of volunteer judges from across the United States and Australia, and then by a final judge in each category. Meet our esteemed panel of judges. Does it have the voice of Erma? Erma knew how to portray the humor in the mundaneness of everyday life. Is it organized? Does it stay on topic and have well-developed ideas? Does it have a compelling lead? The piece should "Hook 'em with the lead. Hold 'em with laughter. Exit with a quip they won't forget." General criteria as stated above. Is it true and does it evoke emotion? $1,000 cash prize to winners in all four categories. First place winners also receive free admission ($450 value) to the Erma Bombeck Writers' Workshop hosted by the University of Dayton from April 5 through April 7, 2018. First place winners who have already registered and paid for the Workshop will have their registration fee refunded. Winners who are on the Workshop Waiting List or have not registered for the Workshop, will be admitted to the Workshop, if they want to attend. Winning essays will be published on Washington-Centerville Public Library's website and in a local newspaper. Judges will also select several essays for Honorable Mention. Writers of essays selected for Honorable Mention will receive a competition certificate. Winners will be announced the end of February. 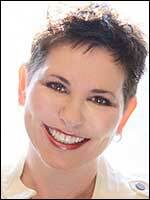 Erma Bombeck Celebration & Awards Ceremony Welcomes Tracy Beckerman! Due to unforseen circumstances, Betsy Bombeck is unable to attend as keynote for this event. Please welcome author, speaker and columnist Tracy Beckerman who will offer her humorous and inspiring advice for writers. The Awards Event will also honor the winners of the Erma Bombeck Writing Competition who will read their essays in both the Humor and Human Interest categories. Everyone is welcome to attend this free event. Refreshments will be served. Registration is required to ensure adequate seating. The Erma Bombeck Writers' Workshop sold out in a record four hours and 42 minutes! Please visit the website to join the waiting list. Workshop dates: April 5 - April 7, 2018. Read about the keynote speakers, sessions, and workshop presenters on the Erma Bombeck Writers' Workshop website. Attendance at this workshop is NOT required to enter the writing competition. Applications are due by midnight (EST) Oct. 6, 2017 with winners announced Dec. 4. The program is open to all humor writers regardless of gender or comedic point of view. Writers working on novels, narrative non-fiction, plays, essays, sitcom scripts and other humor writing are encouraged to apply, with special consideration given to emerging writers. Application fee is $25. Entries will be blind-judged by preliminary and finalist judges, all established writers. Winners also will receive a free registration to the April 5-7, 2018, Erma Bombeck Writers’ Workshop, dubbed the "Woodstock of Humor." Devoted to both humor and human interest writing, it’s so popular that it sells out within hours. The Marriott at the University of Dayton is an in-kind sponsor for the workshop and the residency.